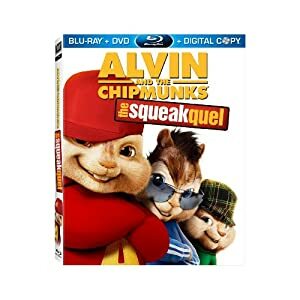 This is a Sponsored Post written by me on behalf of Alvin and the Chipmunks. All opinions are 100% mine. I don't know about all of you, but movies are love in this house. The boys and I often sit down before bed to watch a movie and just relax together as a family. Due to financial constraints, we don't get to go out to the theatre very often, but when we do, we make sure we pick something that we all want to see. Back at Christmas, our yay friend Jim gave us a "family" pack to the movies in Lansing. The boys immediately jumped all over seeing Alvin and the Chipmunks: The Squeakquel. I'm glad that they did. We loved the movie! We all voted that it was actually better than the first. Of course, as a mom who lived way back in the 1900's and as a dj who loves playing slightly offbeat music, I was thrilled when Alvin and the gang came back out to play. I love sharing "old" things made new again to my boys. Now, the movie is out on DVD, Blu-ray and Digital Download! We're all twitching to add it to our collection. It may be a while before we can afford any new movies, but when we can, this one is going to be right at the top of our list. Plus, there's the Double DVD Pack that includes "The Squeak Along" Bonus Disc, with more music, mayhem and all-new singalongs! If you're looking for some good family friendly fun, don't hesitate but buy it now. Plus, check out http://www.foxfamilyflicks.com/ for More Munk Mayhem.